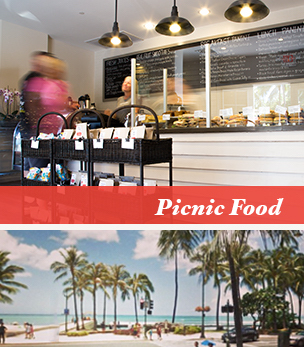 Come down to our Picnic Food locations on Waikiki Beach -at the Park Shore Hotel, or the Hyatt Regency Waikiki for sandwiches, salads, acai bowls, green banana bowls and smoothies. Everything can be packed to-go for a picnic on the beach, at the park or on a hike. Open daily 6am to 730pm (Park Shore); 630am-7pm (Hyatt Regency). Offering fresh and healthy options for all your catering needs. Contact us at catering@tuckerandbevvy.com for more details. 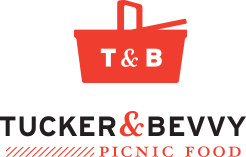 Tucker and Bevvy Picnic was founded in 2013 on the shores of Waikiki beach. The brain-child of Tony Sargent and Cecily Ho Sargent, Tucker and Bevvy reflects the decades of experience the couple gained owning and managing successful restaurants in Sydney Australia, prior to relocating back to Cecily’s hometown of Honolulu. Tucker and Bevvy is renown for its carefully crafted menu that uses the freshest locally sourced organic produce and meats. From the eggs and beef, which are raised on Hawaiian farms, to the nitrate free deli meats, to the freshest produce, and poultry raised without antibiotics, Tucker and Bevvy is providing its customers with healthy food, on the go and supporting the local economy and industry. Grab and go options are available for “real” fast food, as well as made to order panini, smoothies and juices. Tucker and Bevvy prides itself on providing customers with a wide variety of unprocessed, preservative free and nutrient dense meals and snacks. Please come in and visit us at Tucker and Bevvy Picnic or contact us at Tucker and Bevvy Catering to discuss our wide variety of catering menus for your next event. It’s our mission to provide you with the very best food with simple, straight forward, and clean ingredients.